• For decades we train many techniques, combinations, katas, so many of them. Though all that is important, what actually do we know? All we know is just a bit more than nothing, just a bit more than zero. Mind power is everything. • It is more important to think about the power in the lower part of the body (“Under body” he used to say), than to rely on the upper body power. • In order to achieve absolute body control, which is to unify physical and mental potentials, Ibuki breathing must be developed and applied. • It took me forty seven years to get it, but I know now, this is Budo. • Considering the ideas and the concept that is based on, Kase Ha Karate-Do is not a sport but a Budo martial art. • Budo is a life philosophy which emphasizes personal and spiritual development through determined physical and mental practice of martial technique while respecting the Bushido moral and ethical code. • The ultimate goal in Kase Ha Karate-Do is to reach the level beyond technique and physical power, i.e. to develop ability to induce Ki energy. • Further development in Kase Ha Karate-Do is based on specific, Ibuki, breathing from the centre - Tanden - in the lower abdomen as well as concentration and visualization as a crucial means of development of the mind. This leads to the highest spiritual level and the ultimate in energy control. • The highest level of mind development in Kase Ha Karate-Do leads to achieving composure of mind reflected in the state of “Mushin”- Empty mind or No-mind - but also to connect martial spirit with the everyday mind which is the essence of Zen philosophy. That is why the practice of Kase Ha Karate-Do is a kind of Zen in motion or Do-zen. 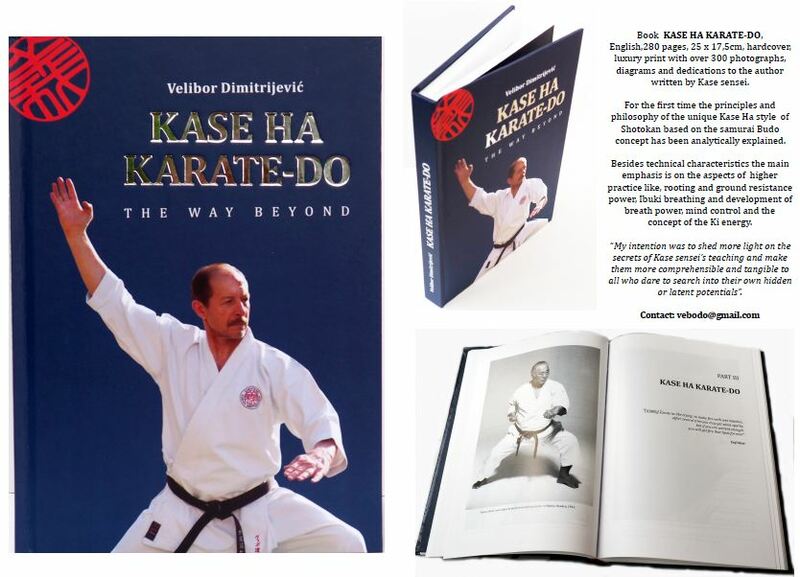 • Kase Ha Karate-Do is based on an extremely strong and highly developed defensive system. It involves a variety of blocks with open and closed hands and an understanding of Kamae positions to control the space around the defender. Inspired by the samurai use of the katana, Kase sensei developed and implemented unique system of defensive and offensive open hand techniques. • In Kase Ha Karate-Do, Fudo Dachi is the basic stance used at master level. It is gradually developed from basic stances and satisfies equally defensive and offensive requirements, insuring at the same time ultimate stability and body control due to the strong ground connection. • The Kase Ha style is unique in the way it approaches Kata using the Budo concept as the root of training. The approach is based on four direction of practice, Omote, Ura, Go and Go-no-ura, and respective application systems employing Kata Kumite, Bunkai and Oyo Bunkai. • The Kase Ha Budo Karate-Do symbol is the ideogram Gi. It means moral duty, the highest form of a warrior’s honor, morality and dignity. Gi also means to renounce any selfish behavior, to follow a voice of reason and contribute to humanity. Gi stands for Funakoshi Gichin and his son Yoshitaka, founders of the Shotokan style. • From the technical point of view, Kase Ha Shotokan Ryu Karate-Do shares the curriculum of the traditional Shotokan line founded by Gichin Funakoshi. However, Kase sensei was strongly influenced by ideas and teachings of his son Yoshitaka Funakoshi. • During sixty years of continual practice and search for the level beyond, Kase sensei made many corrections and changes in order to improve on the traditional approach; he introduced new, innovative techniques and training methods which distinguish his approach as a unique style, Kase Ha Shotokan Ryu Karate-Do. • The essential differences lie, not only in aspects of technique, but more fundamentally in the way that power is generated. In the traditional Shotokan approach the source of power is mechanical body movements together with muscle contraction (External), while in Kase Ha Karate-Do, like all Budo martial arts, power is derived from the Slow of Ki through the body (Internal). • In Kase Ha Karate-Do power is the result of Ibuki breathing from Tanden which the traditional Shotokan line does not recognize. In order to control the delivery of breath power the pelvis is stable and firmly connected to the ground through the stance which absorbs and further conveys reactive power from the ground. Contrary to this the traditional style uses rotational pelvic movement as the major body action. This torque action causes entire body structure to shake and become unstable. • Simple analysis of the body mechanics of a traditional Zenkucu Dachi shows incorrect feet, knees and pelvic positions, which inhibit the development of the maximum power output. At the same time such positions are very harmful because the forces created in the stance structure are unbalanced which in turn causes serious injury and permanent damage to the knee joints and the lower back. • In Kase Ha Budo Karate-Do, Fudo Dachi stance is “dynamic structure” which is meant to generate power. The way the feet, knees and pelvis are positioned and mutually linked, make the stance very strong and stable, allowing at the same time the load and the tension of the stance to be directed to the floor, protecting the joints from excessive strain. At the time of feudal Japan martial arts was called Bujutsu, BU meaning martial and Jutsu meaning techniques, similar to Kenjutsu or the art of handling the katana. Over two and a half centuries, during the rule of the Tokugawa shogun and his successors, practice of martial arts took a new dimension. Bujutsu grew into a Budo. The technique known as Jutsu grew into Do also known as Way of life, thus, leading to Kenjutsu becoming Kendo, Kyujutsu becoming Kyudo, Jiujutsu becoming Judo and Aikijutsu becoming Aikido. Training in Budo was aimed at achieving higher values than those obtained in Bujutsu. While in Bujutsu technical efficiency was of the highest importance, in Budo, martial techniques were used as a means towards deeper understanding of one’s own self. And with Kenjutsu becoming Kendo, the technique of the sword became “a way of the sword,” evoking the need to overcome physical and technical abilities while achieving the highest mental and spiritual values. Katana, which is a symbol of the samurai’s spirit, was not meant to cut the opponent but rather to cut down one’s own prejudices, ignorance, arrogance and egotism. Budo martial arts were not considered sports. On the contrary, Budo martial arts were conceived as strict and even harsh disciplines, which were meant to train mind through daily training of the chosen martial discipline.However, the ideogram BU can be also interpreted as a discontinued warfare, in which the essence of Budo is not only in achieving combat readiness and abilities, but in finding peace and self-mastery. Self-cultivation requires persistence, patience and time, and in following such a way, commitment and determination are much more important than haste.Karate-Do practice should have a substantial impact on the lives of those practicing it. By attaining the highest technical and physical skills, while not developing moral and ethical values leads to the deviation from the authentic essence of Karate-Do. The development of martial philosophy inevitably led to the creation of the samurai’s strict Bushido code. The Bushido code was influenced by various teachings and doctrines. Nevertheless, crucial influence came from Zen, the Chinese philosopher Confucius and from the Japanese native Shinto religion. This created a unique life ideology that has for centuries influenced the formation of the entire Japanese nation. The ideal of the samurai warrior was created. The Samurai is honest and brave, and above all has refined sense of justice. Honor and dignity are the highest values, and he will not hesitate to lay down his life in order to defend them. Zen is meditation, contemplation. Zen is daily personal experience, ”everyday mind”. Zen is a way which leads to the self understanding as well as to understand the world we live in. Zen is not religion. Zen is a way of understanding life, while actively searching for the right path. Zen cannot be accurately described in words nor theoretically explained, because Zen is a personal, inner experience. Zen can be understood only by practicing, because the practice is its essence and the experience acquired at the time of exercise. In addition to the classical way of practicing Zen in the seated Zazen position (Za-sitting, and Zen-meditating), it can also be practiced in the standing position, Tachizen, including in motion, called Ugokizen or Dozen. The authentic approach towards practicing of Karate-Do is a Dozen or type of Zen in motion. The actual body posture is not of importance as much as the idea of practice. The goal is to free the control of the conscious mind and reach the state of the “absent mind,” also known as Mushin and literally translated as No-Mind state. Mushin is a mental act where conscious thinking ceases and that is known as the core in Zen. In Japan, Zen is known as the philosophy of the samurai. When one slash of the katana determines life or death, time does not exist as there is only a moment for timely reaction. That is possible only when mind is free from thoughts. Reaching the state of mind free thoughts is the pinnacle in Zen training, so it is only logical that Zen was an inseparable part of the samurai’s tradition.